How can organizations build a race equity culture? This was the central question at the workshop co-hosted by Center for Public & Nonprofit Leadership (CPNL) and Equity in the Center on September 7, 2018. 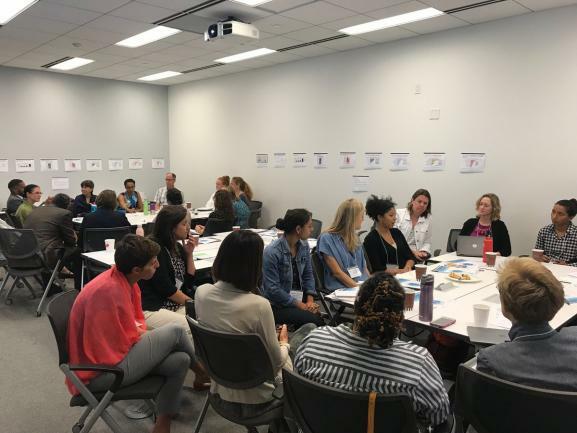 Bringing together organizational teams from 14 nonprofits from the Greater Washington Region, the event addressed what steps organizations can take to further racial equity within their own boards and staff. A lack of board engagement – One person indicated that their Board of Directors didn’t think that racial equity was a problem within their organization. Pace of the work – Participants noted a disconnect between the conversations happening around race between staff, senior leaders and board members. In some cases, staff were moving too quickly for upper-level leadership, which resulted in disengagement. Organizational culture – A number of organizations cited an organizational culture (based on white norms) that made it difficult to prioritize this work. Even organizations led by people from diverse backgrounds are not necessarily implementing racial equity policies. Prioritization – Nonprofit staff are already over-worked and adding racial equity to their plates can lead to emotional fatigue. Organizations are also trying to figure out how to continue their work on racial equity when leaders of the effort leave the nonprofit. After sharing what challenges existed, the breakout groups were asked to offer priority action steps to move their racial equity work forward. One participant suggested finding an ally on the Board of Directors who would be able to champion diversity. From a financial standpoint, others highlighted the need to integrate decisions on racial equity within the budgeting process at the start of the fiscal year. Additionally, ensure that program budgets account for work on racial equity so it isn’t an afterthought, or included in overhead expenses. Another key insight from an organization that was just beginning its work on racial equity was to incorporate racial equity into strategic and operational discussions that were already occurring. The participant noted that their organization would incorporate racial equity in their next strategic plan and include it as a component of analysis as they conduct succession planning for their Board of Directors. Finally, participants suggested a variety of ways for increasing the involvement of community members in programmatic design and strategic decision making.